In 1989, when the DJV unleashed its brutal unremitting terror on the Sri Lankan people, the Government countered terror with terror and Sri Lanka became a playing field for the unknown gunmen who killed at will. Like animals, the killers went into frenzy when they saw blood. Burning bodies littered streets of the thrice blessed isle of ours. The air smelt of death and the unbearable stench emanating from the cadaver befouled the atmosphere. Two of the murders committed by the DJV that shocked my conscience were the killing of Sagarika Gomes and Premakeerthi de Alwis. Sagarika Gomes was a young artiste. She had to struggle to come to the limelight. (She saw the fate of many others who sang and took part in teledramas, acted minor roles in the cinema, and then faded away. Every single artiste dreams of becoming a super star. But, the fact is that an artist’s life has little success and is followed by failure and shattered dreams. They fade away quicker than coming into limelight. There was no opportunity for them to sustain their appeal. Their philosophy was not to miss an opportunity though it entailed difficulties. The opportunity must and ought to be grabbed with both hands.) At that time, cinema had virtually given way to television and to appear on the small screen was in itself an achievement. Sagarika Gomes had the necessary attributes. She was a pleasant girl with a good disposition and was able to sing and act quite well. When the JVP terror struck, all the artistes, especially those in the Rupavahini Corporation and ITN, who read the news bulletin, were threatened. Premadasa’s Government had to ensure that the news was broadcast. DJV should not take the credit for stopping the telecast. With the threats, all the TV newscasters refused to perform their duty. Then, one day, the Deputy Minister of Information, A. J. Ranasinghe, met Sagarika Gomes and asked her to read the news. Sagarika Gomes was thrilled. This was the opportunity she had been waiting for, for a long time. To become a newscaster was the dream of many an accomplished artiste. As an amateur, she read the news quite well. However, her mother and friends were concerned about her safety. When darkness fell, there was a self-imposed curfew by the DJV. The entire country was in virtual darkness and the streets were deserted. At about 08.30pm, there was a knock on the door of Sagarika Gomes’ home. There was a group of armed young people who threatened to break down the door and called for Sagarika Gomes. When her mother howled in anguish and begged the intruders not to harm her daughter, the chief of the intruders said that “we will not harm her; we just want to question her”. Sagarika Gomes was taken to the beach and raped. She was killed by these brutes and left on the beach. 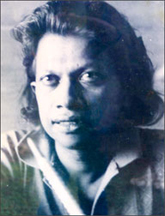 Premakeerthi de Alwis was the most talented young lyricist and poet of his generation. His ability to use Sinhala words and to assemble them in the most beautiful manner, evoking the feelings the poet wished to render to the reader, and the manner in which the words assembled in the poets own quixotic ways, rendering the timeless power of romance that resonates in one’s ears, culminating in a divine feeling of unimaginable glory, was immense. Premakeerthi de Alwis belonged to the Colombo poets and was not acclaimed as a lyricist of any value and suffered from this ignominy. Like many artistes of the 80s, who were poor, he lived on a day to day basis. On July 31, 1989, when Premakeerthi de Alwis went home after working at the Rupavahini Corporation, he never thought the threats he received through anonymous telephone calls or the death threats scribbled on paper found in his locker, supposed to be from the DJV, was the work of fellow artistes who found the rise of Premakeerthi de Alwis unbearable. He was a socialist. He argued why any revolutionary organization should direct its energy to kill an artiste loved by people. He was story teller par excellence. After he went home that evening, there was a knock at the door and there were several armed young men in dark shirts standing there. He immediately thought of the DJV and of an escape route. He went to the back compound of his half built house, with the view of escaping through the back garden. He saw other men armed with shotguns guarding the backyard. He knew that there was no escape. His wife came yelling with fear. They knew that DJV Dracula had entered their house. The young men, all dressed in dark kits and with their faces covered, assured his wife, crying and rolling in the compound, that nothing would happen to him. They said that they just wanted to question him and he would then be released. Premakeerthi de Alwis was taken away. The voice, loved by millions, was silenced by the megalomaniac Rohana Wijeweera. 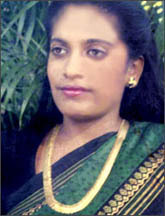 Ranjini Thiranagama was a prominent human rights activist in Sri Lanka. I do not think there would be anyone today or in the future who would surpass her commitment, her dedication and her passion. Today, the NGOs and INGOs have become the partners of the LTTE. They have used the global influence they wield to disguise the activities and the ruthless barbarism of the LTTE by calling them liberators. Every single country that supported the LTTE is responsible for the deaths that occur even today. Ranjini was different. When the great tribal chief of the NGOs denounced the alleged violations of the Sri Lankan forces, but remained deaf and dumb stricken when the LTTE blasted hundreds of innocent civilians, women and children into smithereens with the aid of suicide bombers, some, instead of addressing the issue, pleaded for all parties to negotiate peace. Negotiate with whom? They are silent as they are dysfunctionally, physically and mentally unable to name LTTE as perpetrators of crime. Ranjini was different. She instead founded the University Teachers for Human Rights (UTHR). Like other organizations in Jaffna, which became the intellectual veil of the LTTE, its academic, scholarly manifestation to conceal the rivers of blood which flowed through the Northern and Eastern territory, destroyed other leaders amongst the Tamil youth, who had the aspiration to achieve Eelam, UTHR exposed the truth. The LTTE sought to, by destruction and annihilation, murder and mayhem of the Tamil polity, become the sole representative of the Tamil People. She was icon when she worked for the LTTE and became an iconoclast when she included the LTTE as violators of human rights. Ranjini steadfastly refused to trade her principles. After the riots of July 1983, she refused to live in the West and returned to the country of her birth. Ranjini had won a scholarship to Cambridge to do her post graduate studies. Her academic career was brilliant and at the end of it she could have readily found employment in any University in the West. But instead she decided to return to Sri Lanka to head the Anatomy Department of the Jaffna University. She soon found the euphoria, the excitement and the hope of her race, when Rajiv Gandhi sent the Indian Peace Keeping force to ensure peace, soon turn into a nightmare. The Tamils suffered most under the Indian Peace Keeping Force. The wheel was turning a full circle. The Indian army which trained the terrorists found that quite unexpectedly the guns of the LTTE being turned on them. She found her people sandwiched between the guns of the Indian Army and the LTTE. They suffered from both sections. She saw the brutality of the whole exercise. The Indian Peace Keeping Force’s extra judicial killings, on mere suspicion and the rivers of blood that flowed from Prabhakaran’s gun killing her own people. She wrote about the quandary, the predicament of her people unable to voice their hatred towards the so-called sole spokesman of the Tamil people. She wrote, “There are no mass organisations which can effectively mobilise the people, or voice their needs and opinions ... there were all the externals of change: Murals, Tiger courts, ribbon cutting by the Tigers! But the people have no role. They are spectators, bystanders, unable to determine the course of their struggle.” When her struggle to educate the terrorists failed, she and others published one of the most important documents on human rights violations in Jaffna, ‘The Broken Palmyrah’. Ranjini, a scholar from Cambridge, wrote prose like Premakeerthi de Alwis’ poetry and lyrics. After the publication of this compendium on rights violation committed by all parties, including the LTTE, she wrote, “One day a gun will silence me. And it will not be held by an outsider, but by a son born in the womb of this very society - from a woman with whom my history is shared.” She was gunned down by the LTTE in 1989. The parallel between the JVP-DJV and the LTTE is quite obvious. The path to liberation of the JVP-DJV, LTTE stemmed from oppressive violence that motored down any opposition and deprived the very rights that they said were fighting for. These three incidents clearly prove the nexus that the LTTE has with the JVP - the LTTE resented any democratic opposition, and resented any other armed group. In order to justify its existence, the LTTE eliminated all other armed groups in the most inhuman and barbaric manner and thereafter started killing all the democratically elected Tamil members of parliament. After doing so, they claimed to be the sole spokesmen of the Tamil people. The JVP wanted to be the owners of the revolution. They were averse to any kind of opposition and claimed to be the sole interpreters of Marxist-Leninism. Like the LTTE, during 1989 the JVP killed many SLFP and left politicians. So, the nexus between the JVP and LTTE was to “kill and destroy your opponents to achieve your ambitious goals”. One might dismiss this argument as a counterproductive notion of two extremist parties. Nevertheless, if you seriously analyze them, you find that both the JVP and the LTTE are racist parties, who want to achieve power through armed struggles, and are opposed any devolution of power. The LTTE believes in the realization of the state of Eelam. The propaganda machine of the JVP relentlessly pursued a racist, anti-Tamil line. When any Government came to the verge of devolving power, the JVP wreaked havoc in the country. Their movement was widespread, their rhetoric simple, and there were hundred of arguments that could be put forth to prove their viewpoints. When the Indo-Lanka Agreement came, the JVP provoked murder and mayhem in the country, opposing any form of devolution of power. The question that should be asked is: ‘how could one avert the fact that there is a nexus between the JVP and the LTTE?’ If you analyze the history of the LTTE, one would note that they followed, like the Vaddukkoday resolution of 1976, where the elderly Tamil statesmen resolved that the only opportunity available for the Tamils to redress their grievances was the creation of a separate state, Eelam. The LTTE and all the other armed groups insisted on the Thimpu Resolution of the right to self determination of the Tamil people. In order to achieve this dream the LTTE killed even the elder statesman of the TULF. Though they pay homage to SJV Chelvanayakam, if the old pacifist was living he would have been appalled by the naked brutality of the LTTE which has absolutely no qualms about killing men, women and children. It is obvious to any prudent man that the only way to defeat the concept of Eelam is to defeat LTTE militarily and prevent any off shoots sprouting from the buried armed struggle of the LTTE. To eliminate politics of the gun is to make them feel that they are able to use the pen instead of the T56 and to devolve power to the Northern Province, and to have meaningful and continuous dialogue with the Tamil people to make them feel that they are not isolated. Let there be more Pillaiyans, more Karunas more Muralitharans, more Ananda Sangarees, more Douglas Devanandas and let them unitedly usher in a new era of peace and liberation for the Sri Lankans as a whole. What better leader do we have to achieve this goal than Mahinda Rajapaksa.